In 1912, a representative of the federal Indian Department chose the site for a new Indian Residential School, about seven miles northwest of The Pas, bordering on the Opaskwayak Cree Nation. Twenty acres of forest were cleared and a building was constructed between the Fall of 1912 and June 1914. It opened for classes in October 1914, named in commemoration of Anglican archdeacon John Alexander Mackay of Saskatchewan. 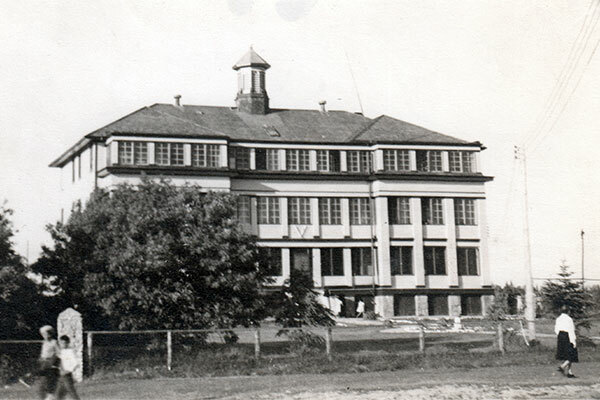 The school was administered by the Bishop and Diocese of Saskatchewan until January 1922 when it was transferred to the Missionary Society of the Church of England in Canada. It was destroyed by fire on 19 March 1933 and was not rebuilt. Another facility of the same name operated at Dauphin from 1955 to 1980. The former school site is now used for community cultural and sporting events. Some foundations are still discernible at the site. Mackay School, The Pas, MB, Anglican Church of Canada. “MacKay Indian Residential School,” The Pas: Gateway to Northern Manitoba, The Pas Historical Society, 1983, pages 81-82. We thank Robin Reader for providing additional information used here.